A4988 surface mount QFN package (ES), a size of 5 mm x 5 mm, nominal overall package height of 0.90 mm, with an exposed pad for enhanced thermal dissipation. This package is Pb (suffix-T), with 100% matte tin leadframe plating. (1) Low RDS (On) Output. (2) Automatic current decay mode detection/ selection. (3) Mix with slow current decay modes. (4) Synchronous rectification for low power dissipation. (1) Simple step and direction control interface. (2) Short-to-ground and shorted-load protection. (3) Five different step resolutions: full-step, half-step, quarter-step, eighth-step, and sixteenth-step. (4) Over-temperature thermal shutdown, under-voltage lockout, and crossover-current protection. (5) Intelligent chopping control that automatically selects the correct current decay mode (fast decay or slow decay). 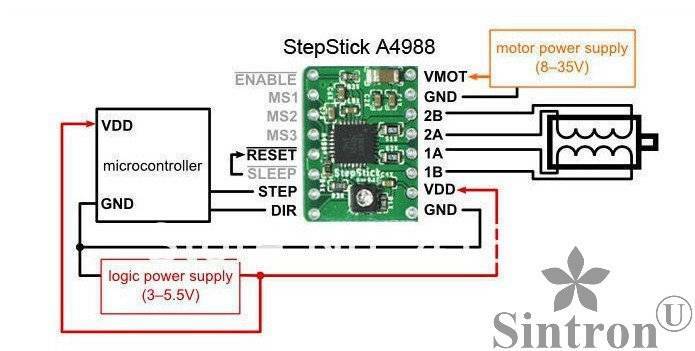 (6) Adjustable current control lets you set the maximum current output with a potentiometer, which lets you use voltages above your stepper motor’s rated voltage to achieve higher step rates.